As Sardar Usman Buzdar takes oath of the office of CM Punjab, one issue that will dominate his agenda for the next five years is the provision of clean drinking water to the 110 million population of Punjab. He will be undertaking this herculean task in the backdrop of Shahbaz Sharif’s failed Saaf Pani Program (SPP) and there are lessons that need to be learnt from the failure. Believe it or not, there were compelling reasons to initiate the Saaf Pani Company in 2013-14. Existing departments such as the Public Health Engineering Department (HUD-PHED), Local Government department (LG-CDD) and WASAs are decadent and cannot be expected to bring about a revolution in the water sector. The idea of launching a parallel, new structure to bring in private sector expertise and attract the best human resource (hence, the exorbitant salaries) was sound. However, Shahbaz Sharif’s authoritarianism is to blame for the failure of the program. Although there were world renowned firms (e.g. German giant Fichtner) developing water solutions, Khadim-e-Ala wanted to keep a tight grip on the project. He installed his favorite (and non-technical) officers as the CEOs and political allies as Chairmen of the Board. The countless review meetings for the project were humorous - as the CEOs and high-level bureaucracy would get censured by the Chief Minister as they were unable to meet deadlines due to the fact that the CM himself kept changing the model of water infrastructure to be adopted. It was comical to see the SPP being split into two companies on the CM’s whim and then the CM himself suggesting that perhaps one would suffice. He kept instituting one committee over another, to decide some insignificant detail and then would take the decision himself regardless of the committees’ suggestion. Tax-payer’s money was wasted on international “road-shows” – all of which ended with Shahbaz scrapping one procurement after the other because “reputable” firms failed to bid. Today, the CEOs are returning their paychecks on the orders of the Supreme Court while Shahbaz attends NAB hearings on alleged corruption. However, the underlying issue is still the same – the ~8,000 water supply schemes and filtration plants in Punjab, close to 90% do not provide water fit for drinking. This number itself is dubious since the Government’s water testing laboratories are unable to test for all impurities and contaminants (including arsenic). Moreover, a fifth of the population is still unserved by a water supply scheme. There is some light at the end of the tunnel though. The new Chief Minister will have at his disposal the young, vibrant and data-driven Special Monitoring Unit, which has already prepared a roadmap for water sector reform. With help from water experts and untainted bureaucrats, the CM should set provision of clean drinking water as one of his top priorities. It would be wise, however, not to use the title of “Saaf Pani”. Reko Diq is the largest copper-gold deposit in the world. 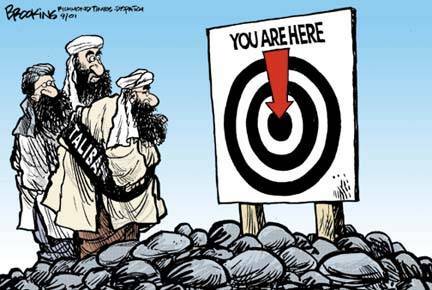 Unfortunately, it is located in Pakistan. Had it been a few kilometres north under the territory of Iran, it might have been the World's biggest producer of Gold. But as with Lakhra coal in Sindh, Pakistan's authorities are not interested in mining Reko Diq. First, an agreement was reached with BHP in 1993. The rights changed hands, and the latest owner was Tethyan Copper Company, a joint venture of Barick (Canada) and Angofagasta (Chile). The Government of Balochistan was unhappy with the terms of agreement reached in 1993, and challenged the agreement in the Supreme Court, and did not renew the company's license. The Supreme Court ordered in 2013 that the agreement was a farce and that the GoBalochistan could now enter a new agreement. The TCC says it had spent $220 million during the past five years on exploring the deposits in the ochre sand desert, and was planning to invest a total of $3.3 billion when the provincial government abruptly refused to grant it a mining licence. The previous government also provided rights of Reko Diq to a Chinese company which had angered TCC. TCC went to the International Centre for Settlement of Investment Disputes (ICSID) to challenge the granting of license to the Chinese company. Due to serendipity and a good show by Dr. Samar Mubarakmand, the case was dismissed in favour of the Balochistan Government. Consequently, TCC decided to give up its right to mine Reko Diq and will be seeking damages from the Government. But now, there is no indication by the Federal Government or the GoBalochistan with regards to the mining of Reko Diq. Dr. Samar Mubarakmand is leading exploration in a niche, but obviously Government Authorities do not have the resources for large scale mining. Mr. Mubarakmand was also critical of the last Government for allocating only Rs. 1400 million for the project whereas the cost for laying a water-sewer system is Rs, 1980 million. This is not new from Mr. Mubarakmand. He has dealt with the Lakhra Coal Gasification project in the past. The success or failure of that project has always been debated but Mr. Mubarakmand continued his critique of the Government for non-allocation of funds. Moreover, the Government has not made a case against the TCC. Barick of Canada (parent of TCC) has been implicated in a separate case for harming the environment and has agreed to pay a record fine of $16.4 million. This should be ground enough for the Government to refuse to pay/or reduce the payment of damages to Barick, which is said to be under a state of freeze since the verdict. It is time that the Government carries out an independent and transparent auction of Reko Diq's mining rights. Previous unauctioned takeovers by China at Gwadar and Saindak have not resulted in propitious results for the people of Balochistan. With the new pro-people Government in place in Balochistan, I hope a decision will be reached soon. Drums rolled as Ishaq Dar stood behind the podium to address a press conference flanked by Info secretary Pervaiz Rasheed and Babar Ghouri of the MQM. Ghouri, supporting a newly placed hair transplant looked fidgety but satisfied. Finally, PML-N had won the support of the MQM, albeit just for the Presidential election which N league is almost certain to win. The two parties have had a love-hate relationship ranging back to the 90s. MQM cried foul play after the '92 operation cleanup in Karachi and yet decided to sit on the government benches soon afterwards. In 2011, when MQM briefly quit the federal cabinet, friendship was in the air as Dar and Raza Haroon of the MQM shook hands but it turned out to be short-lived as the Karachi based party made another U-turn to join the government again. After the May elections, Altaf Hussain taunted Nawaz Sharif by calling him "leader of the Punjabis" and asking him to look into the issues of smaller provinces. If we rewind, Nawaz Sharif had openly criticized Altaf Hussain for being behind the terrible law and order condition in Karachi. Chaudry Nisar went even further by threatening to reveal the "secret condition" of Altaf Hussain to which Waseem Akhter replied by criticizing Nawaz and Shahbaz Sharif's hair transplants. This video sums up the two parties' relationship. Now, apparently, all these accusations have been forgotten. Altaf called Nawaz "his brother" just like he was a brother to President Zardari during the past 5 years. Ishaq Dar vividly remembers the "pakoras" he had with Altaf Hussain. I feel these "pakoras" are not going to sit well in PML-N's stomach and we might see the same outbursts that we have become accustomed with during the last five years. This article is not satirical like the rest of my posts on this page. I will try to highlight some of the policies of the PPP Government which might be of long term importance to Pakistan. · 18th Amendment: A topic which was under discussion during the elections of 2008. This amendment stripped the powers from the President (the incumbent Asif Zardari) and handed them to the parliament. The most important of these clouts was the power to dissolve the parliament, as mentioned in article 58(2)b. This clause was added to the constitution under the Supremacy of General Zia ul Haq. He used it to dismiss the Junejo government in 1988. This clause (and its predecessors) were also used in 1990 (by Ghulam Ishaq Khan against Benazir Bhutto), in 1993 (against Nawaz Sharif) and 1997 (by Farooq Leghari against Benazir Bhutto). Nawaz Sharif did away with this clause during his second regime, but it was reinstated by General Musharraf in 2002. · Completion of five-year term: Although it was marred by corruption, previous governments found it extremely hard to complete their tenure. End of political cases: No cases were formed against any political adversaries. Although, Zardari did try to manoeuvre the judgement of 1999 Airplane hijacking case, later no such activities took place and Zardari called an end to horse trading in his address to parliament in 2009. Flags fluttered in the wind. Rain drenched leaders and followers alike. But few in the crowd of thousands dared to leave the "Jalsa". 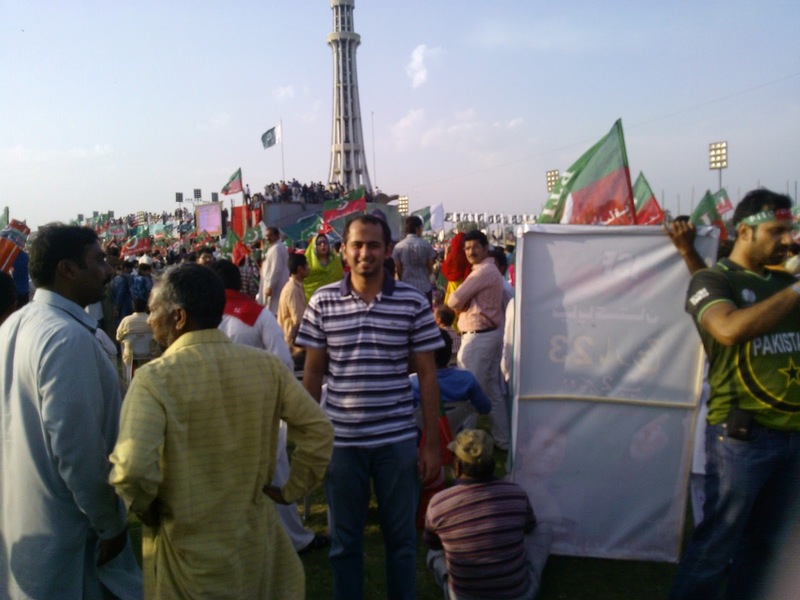 Such was the allure of Imran Khan at the Minar E Pakistan on 23rd March 2013. 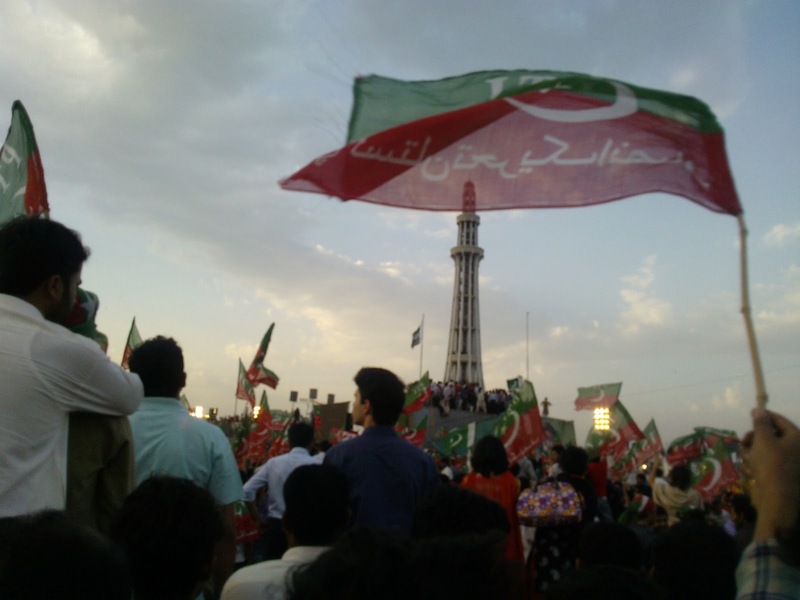 Chanting slogans of change the PTI-ers started gathering at the monument during the wee hours of Saturday. People from all stratas and walks of life could be seen at the Minto Park. Getting to the park was a test in itself. We, I and my dad, parked our car on the Mall Road, before boarding a PTI-sponsored bus which dropped us at the T-juncture of Lower Mall. There we joined droves of people who marched in droves towards the Minar E Pakistan. The "jalsa" started around 4pm when the announcer chanted "LAHORRRRRRRRRRE" for the first of many times. Leaders who addressed the gathering included Aleem Khan, Mehmood ur Rasheed, Abrar ul Haq, Shah Mehmood Qureshi and Javed Hashmi. 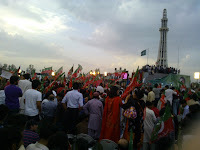 Rain started to fall when Khan sahab took the mic to address the "Tsunami Plus". Contents of his speech were similar to earlier speeches, except that he made six promises to the people and asked them to promise on four similar counts. PTI officials put the number of attendees at a million, a clearly exaggerated figure. But I, present at the venue myself, could only see hordes of heads and flags all around me. The "jalsa" was a success in itself, but what remains to be seen is whether Imran Khan will be able to gain any significant share in the parliament whose election will be held on May 11. 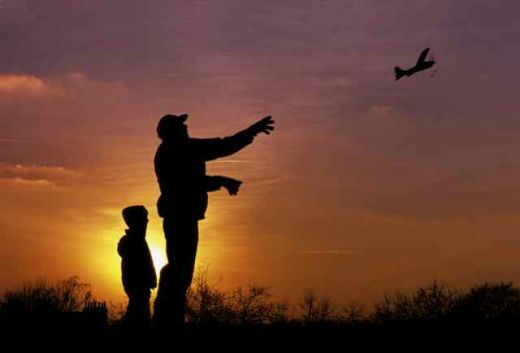 "We have acquired the Drones and intend to use them as soon as possible. We will show a demonstration at 5pm." 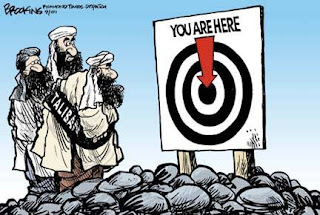 These were the words of a Taliban spokesperson at a hastily organized press conference. The statement sent tremors down the spine of U.S. Secretary of Defence Leon Panetta, who reportedly had to change pants after hearing the news. Red Alert security was ordered at U.S. Embassies around the world. Senior defence analysts, Zaid Hamid said he was not surprised by the news. "Not only do they have drone technology, they are also investing in Nucleur warheads, very soon you'll hear about them as well," Hamid said while playfully adjusting his signature red beret. "Pakistan Army is considering acquiring these drones as well as they might come in handy in case of a war against India." Newly appointed U.S. Secretary, John Kerry, of state flew to North Korea, the rogue nation thought to be behind the sale of the technology to Taliban. "We are trying to track the source of the technology, either its North Korea, Iran or Syria," General John Allen remarked during a TV interview, before cutting the interview short and leaving for Florida after receiving a "flirtatious" text message. Meanwhile, U.S. drones have bombarded 16 places in Pakistan, Afghanistan and Syria in order to "wipe out command centers for the drones". Numerous casualties are reported. Update (6pm): It turns out that the Taliban had defined the drone technology a bit too broadly. The drone launch did take place at 5pm but as the picture below shows, they'll need a bigger aircraft to cause any serious damage.